We have just launched a brand new dental website for our client in Morinville Alberta. The website comes with some very interesting features and latest technology. 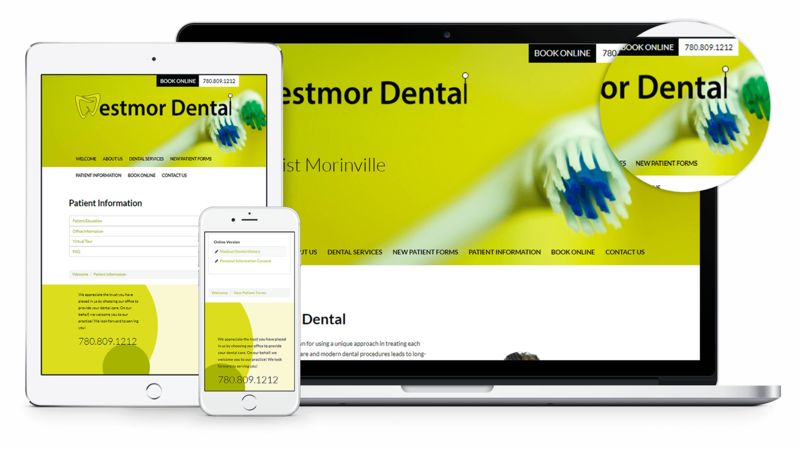 We are pleased to announce that Westmor Dental has a brand new and technologically advanced website! Westmor Dental is dedicated to making a difference in his patients’ lives by providing exemplary dental care. It knows that it takes more than just good technique to be a great dentist office it takes commitment, understanding, and most importantly, a genuine interest in patient health and safety. Their goal is to help you become informed about your oral and dental health. This is why they built this comprehensive website; patient education is their priority and they want you to have the most elaborate and informative reference regarding your oral health. The website has a very warm and inviting tone to its layout. It is built on a responsive design platform therefore you can access it from any device such as desktop, smartphone or tablet. With an interactive Map located under the “Contact Us” page, patients have the visual comfort to access directions to the office itself. The layout and design of the entire website are focused on ease of searching desired subjects.